2. 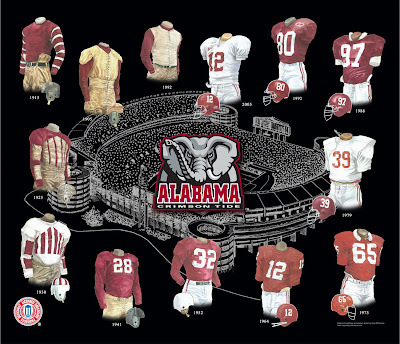 Please note that all of the actual original, one-of-a-kind artwork of the University of Alabama football uniforms as seen in the poster above are actually available for sale. These watercolor paintings are truly beautiful, original watercolor paintings, and there are only 12 of them so please act quickly if you would like to buy one. These would make a wonderfully memorable, beautiful and completely unique gift for someone who loves Alabama football. 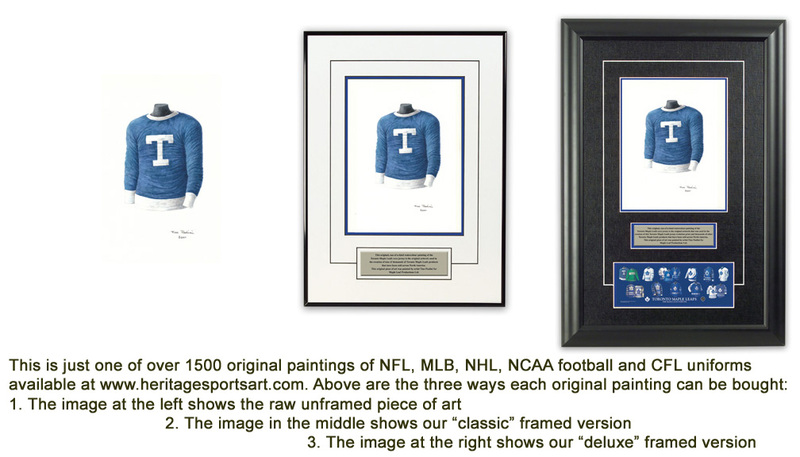 If you would like more information about this great artwork including the three ways you could purchase each piece, please visit our Alabama YouTube video at http://www.youtube.com/watch?v=5bSfVPNsYHw or go directly to the artwork website http://www.heritagesportsart.com/Alabama-Crimson-Tide-c80/ where you can see and purchase the artwork. The University of Alabama is located in Tuscaloosa, Alabama. The Crimson Tide football program was founded in 1892 and the squad’s first captain - W.G. Little is considered the father of Alabama football. The Tide plays out of Bryant-Denny Stadium which has a seating capacity of 83,818. The stadium opened in 1929 and was first known as George Hutchenson Denny Stadium. The state legislature renamed the stadium "Bryant-Denny Stadium" in 1975. The Crimson Tide owns a remarkable all-time won/lost record at the stadium (well over .800) and has boasted sellouts at all Tuscaloosa games since 1988. The Crimson Tide football team has captured 12 National Championships in their program’s storied history. Moreover, the ‘Tide has won 21 SEC Championships, more than any other team in the Southeastern Conference. If Michigan was nationally ranked in “The Top 20” (or Top 10 in some years) in a particular season depicted in the poster, we show the team’s ranking. That being said, prior to 1936 there was no nationally recognized poll ranking the nation’s top teams, so you will not see any rankings prior to 1936. 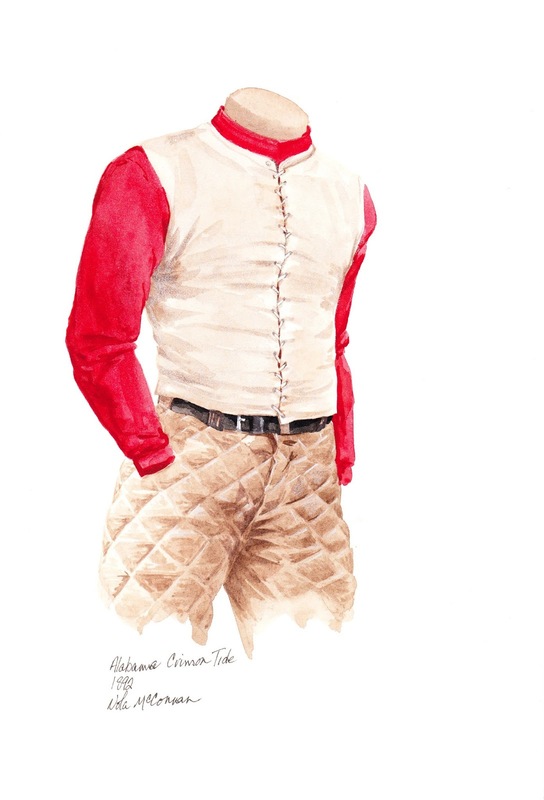 This painting depicts the 1892 University of Alabama football team uniform, the inaugural season for the Crimson Tide. The 1892 team was coached by Eugene Beaumont and went 2-2 in their first season. The star player of that first team was Eli Abbott who would later go on to coach the Tide from 1893-1895 and again in 1903. W.G. (Bill) Little captained that first squad and is considered the father of Alabama football while prophesizing, "football is the game of the future in college life." Tide players in 1892 went helmetless while sporting a light tan vest over a long-sleeved crimson shirt. The pants were a similar light tan in color and numbers were not used on the front of the players’ uniforms. This painting depicts the 1905 University of Alabama football team uniform. The 1905 team was coached by Jack Leavenworth and went 6-4 including a 30-0 win over rival Auburn. Captain Auxford Burks was the star player of the 1905 team. 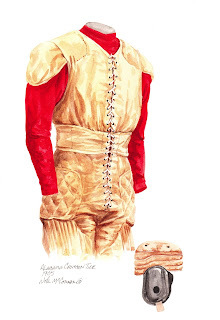 Tide players in 1905 sported a unique, light tan ‘coverall’ uniform overtop a long-sleeved crimson shirt. Players also wore a similarly colored helmet for protection. Numbers were not yet incorporated into the design of the uniform. An excellent sample uniform from the 1905 season is on display at the Bryant Museum. 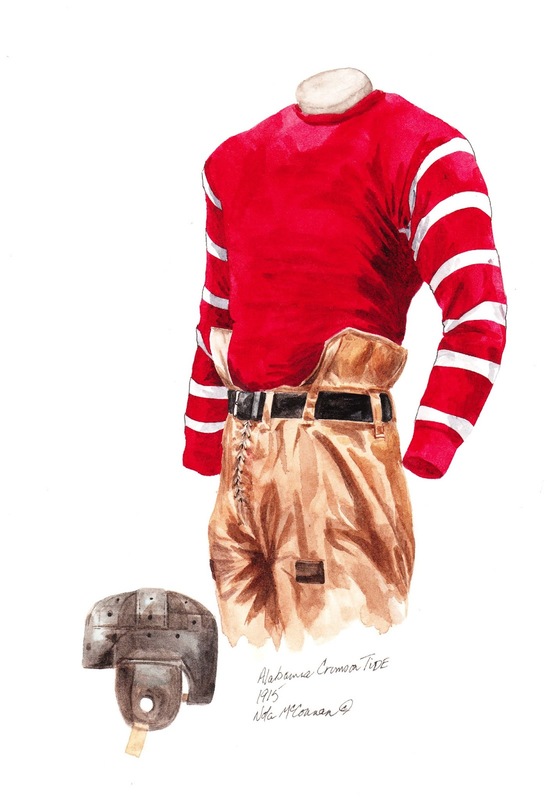 This painting depicts the 1915 University of Alabama football team uniform, coincidentally, the first season that games were played at Denny Field. 1915 also marked the first season of Thomas Kelley’s coaching tenure; Kelley’s charges won 6 games in 1915 while losing two games to Georgia Tech and Texas. Kelley compiled a 17-7-1 record from 1915-1917 as the Head Coach of ‘Bama. W.T. ‘Bully’ Vandergraff, who starred from 1912-1915 for the Crimson Tide, was the University of Alabama’s first All-American player. 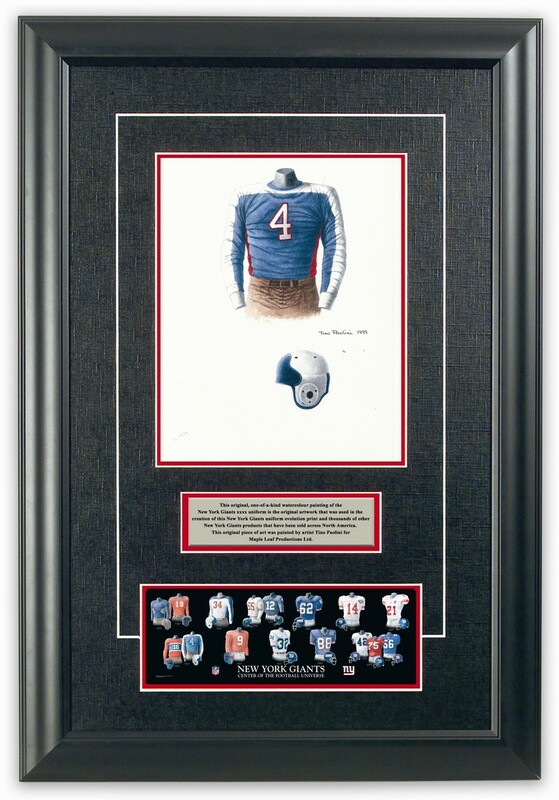 Vandergraff played fullback, tackle and kicker - he was inducted into the Alabama Sports Hall of Fame in 1970. The Tide uniform of 1915 consisted of a long-sleeved crimson red jersey with horizontal, white markings on the sleeves. Players sported black helmets and tan-colored pants. 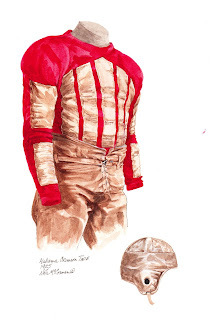 This painting depicts the 1925 University of Alabama football team uniform. 1925 was a magical season in Tuscaloosa. The ’25 team rolled over 10 opponents to become the first in the school’s history to go unbeaten (10-0). Alabama scored 277 points while only allowing a single touchdown all season. For their efforts, the Crimson Tide were invited to the Rose Bowl - the first Southern football team to be so honored. ‘Bama defeated Washington 20-19 to capture National Championship honors. Wallace Wade coached his first of three National Championship teams; the other two titles came in 1926 and 1930. Wade compiled a 61-13-3 record as Coach of the Tide and is inducted in the College Football Hall of Fame. The ’25 squad was led by the dynamic halfback - Johnny Mack Brown and captained by Bruce Jones. Brown scored two touchdowns in Alabama’s first Rose Bowl game and was named the Rose Bowl’s MVP. While in Pasadena, Brown caught the eye of Hollywood producers and eventually became a successful film actor. In 1957, Brown was inducted into the College Football Hall of Fame. Here’s what our friends at Wikipedia have to say about Johnny Mack Brown. Quarterback Pooley Hubert, the second All-American football player in Alabama history was also inducted into the College Football Hall of Fame in 1964. Alabama’s footballers sported crimson red jerseys with vertical, tan-colored, felt markings on the front and sleeves of their uniforms. Players wore numbers on the back of their jerseys and many of them wore helmets for protection. Alabama earned National Championship honors in 1925 and capped off their undefeated season by defeating Washington 20-19 in the Rose Bowl. This painting depicts the 1930 University of Alabama football team uniform. 1930 marked the third national championship for the Crimson Tide as they manhandled Washington State 24-0 in the Rose Bowl game on January 1, 1931. Upon the completion of the Rose Bowl game, Head Coach Wallace Wade was carried off on the shoulders of his players; the game marked the last for the Hall of Fame coach who won three national championships and compiled a 61-13-3 record. The ’30 squad was led by two-time All-American Tackle - Fred Sington. Sington was such a dominant lineman legendary Notre Dame coach Knute Rockne called him, "the greatest lineman in the country." Sington was inducted into the College Football Hall of Fame in 1955. Upon leaving Alabama, Sington played professional baseball with the Washington Senators. The 1930 team also featured two other Hall of Fame players, Fullback Johnny Cain and Guard Frank Howard. Howard would eventually coach the Clemson football team from 1940-1969. For a good story on how Alabama’s Elephant logo came to be – it began in 1930 – please visit the official team website. Tide players wore white jerseys with vertical, crimson red-colored, felt markings on the front and sleeves of their uniforms; jerseys also featured crimson red numerals on the reverse. Alabama footballers also sported white helmets with a series of crimson red strips on the crown. 'Bama capped off an undefeated season by defeating Washington 24-0 in the Rose Bowl game in Pasadena. 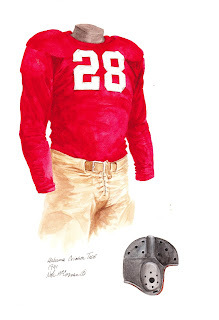 This painting depicts the 1941 University of Alabama football team uniform worn by #28, All-American End, Holt Rast. The Crimson Tide team of 1941 won 9 and lost only 2 before defeating Texas A&M at the Cotton Bowl, 29-21 and earning national championship honors for the fifth time. Head Coach, Frank Thomas succeeded Wallace Wade as field general of the Tide in 1931 and went on to coach until 1946. A graduate of Notre Dame, Thomas played under Knute Rockne. As Head Coach of the Tide, Thomas compiled a 115-24-7 record including two national championships (1934, 1941). Thomas was inducted into the College Football Hall of Fame in 1951. The ’41 squad featured All-American Tackle, Don Whitmore. The Decatur Alabama native also led the Tide to an Orange Bowl victory a year later. After two seasons at ‘Bama, Whitmore moved to Annapolis and the Naval Academy, eventually advancing to the rank of Admiral. He was inducted to the College Football Hall of Fame in 1956. 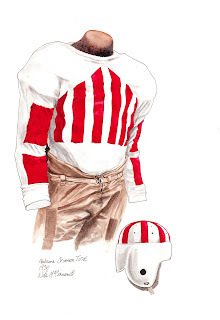 The Crimson Tide football team wore both crimson red and white jerseys in 1941 with alternating numbering on both the front and back of the uniforms. Players wore black helmets and tan-colored pants during this era. The Crimson Tide compiled a record of 9 wins against only 2 losses in 1941. Alabama defeated Texas A&M at the Cotton Bowl on January 1, 1942. This painting depicts the 1952 University of Alabama football team uniform worn by #32, Bobby Marlow, a star Halfback who established many rushing records for the Tide. The Crimson Tide team of 1952 won 10 games against only two losses. At the Orange Bowl in Miami, ‘Bama crushed Syracuse 61-7 for their eighth bowl title. The Tide was coached by Harold ‘Red’ Drew, who patrolled the sidelines from 1947 to 1954 and compiled a 45-28-7 record as Head Coach. Marlow, an All-American footballer, rushed for 2,560 yards in three years at ‘Bama. He was the first pick of the New York Giants at the 1953 NFL Draft. The Tide backfield of ’52 also featured 1,000 yard passer, Clell Hobson. The Crimson Tide football uniform comprised a crimson red, long-sleeved jersey with white numbering on both the front and back; white pants with a single, crimson red stripe down each side and a white helmet with a single, crimson red stripe on the center of the helmet. This painting depicts the famous #12 University of Alabama football jersey of Joe Namath. Joe led ‘Bama to an undefeated (10-0) season before losing a heartbreaker to Texas at the Orange Bowl; despite the loss, the Crimson Tide were already deemed National Champions for 1964. An All-American Quarterback from Beaver Falls, Pennsylvania, Namath played 13 seasons of pro ball, predominantly with the New York Jets. He is a member of the Pro Football Hall of Fame (1985). Here’s what our friends at Wikipedia have to say about Joe Namath. In 1958, the University of Alabama hired Paul ‘Bear’ Bryant to become Head Coach, a position he held for the next 25 years. Bryant amassed an unprecedented record of 232 wins, 46 losses, and 9 ties as coach of the Tide and was named the Associated Press Coach of the Year nine times during his time at Alabama. Bryant guided ‘Bama to six national championships (1961, ’64, ’65, ’73, ’78, ’79) and is enshrined in the College Football Hall of Fame. 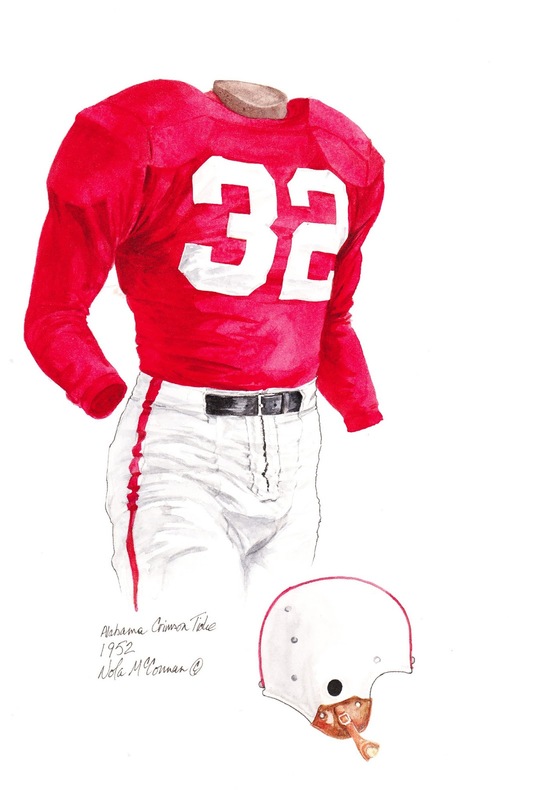 The crimson red Alabama football jerseys of 1964 feature sleeves to the elbow with white numbering on both the front, back, and sleeves. The pants are white with two, crimson red stripes down each side. Tide players wore a crimson red helmet with a single, white stripe that ran from front to back on the center of the helmet; the headgear also featured white numbers on each side. Playing on an injured leg, Joe Namath almost led the Tide to a come-from-behind victory in the Orange Bowl; on fourth down and inches Namath was stopped short of the goal line and Texas held on to win 21-17. Namath said afterward, "I’ll go to my grave knowing I scored." This painting depicts the #65 University of Alabama football jersey of Halver ‘Buddy’ Brown who starred for the Crimson Tide between 1971 and 1973. The All-American Guard from Tallahassee, Florida helped propel the Tide to an undefeated (10-0) season before a 1-point loss to Notre Dame at the Sugar Bowl. The December 31, 1973 Sugar Bowl game was the first ever meeting between two of college football’s most storied programs and the contest itself lived up to all the pre-game hype. Alabama earned both UPI and AP national championship honors following the regular season and retained top spot according to UPI following the loss. Legendary ‘Bama Head Coach Paul ‘Bear’ Bryant added his fourth national championship and seventh SEC title in 1973. 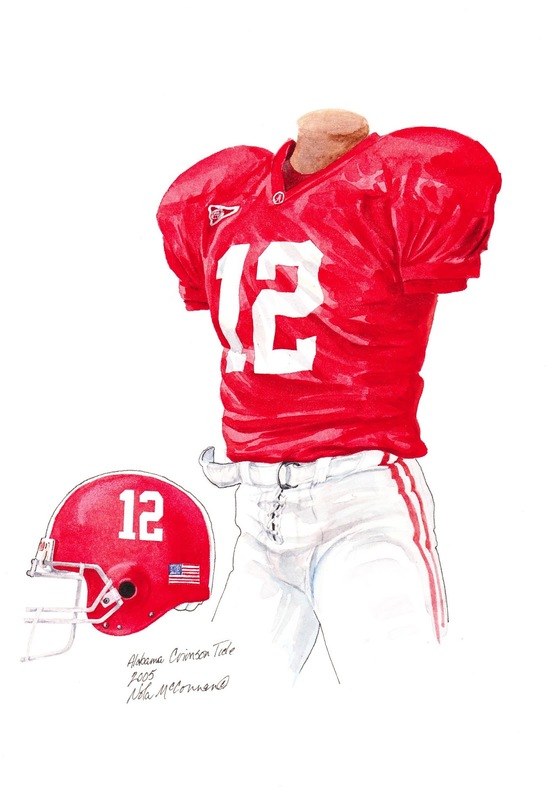 Bryant guided the Tide to 24 consecutive Bowl appearances during his tenure in Tuscaloosa. 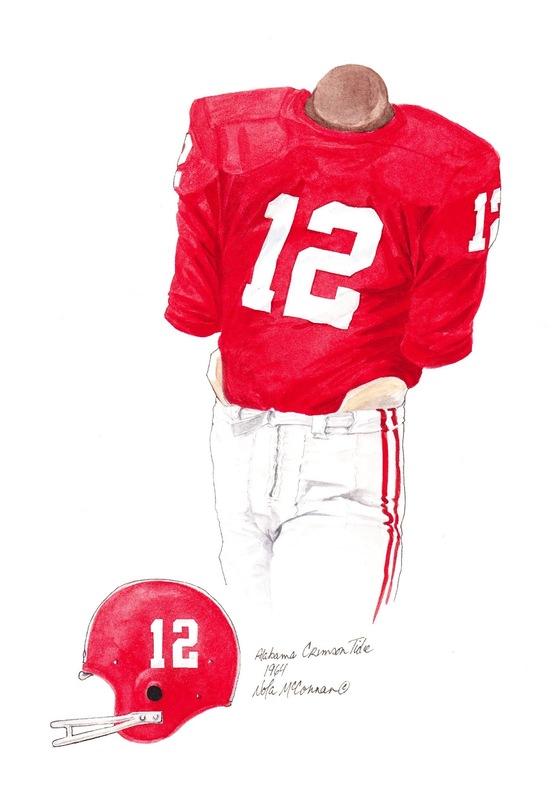 The crimson red Alabama football jerseys of 1973 feature sleeves to the elbow with white numbering on both the front, back, and sleeves. Tide players wore white pants with two, crimson red stripes down each side. Bama’s headgear featured a single, white stripe running from front to back and flanked by numerals on each side of the crimson red helmet. Alabama completed the regular season a perfect 10-0 and lost by a single point to Notre Dame at the 1973 Sugar Bowl, their first ever meeting. This painting depicts the #39 University of Alabama football jersey of E.J. Junior, a star Defensive End out of Nashville, Tennessee. Junior played four seasons at ‘Bama and later went on to earn First Team All-American honors in 1980. Junior also enjoyed a long career in the NFL. The St. Louis Cardinals selected him 5th overall in the 1981 NFL Draft; he played 7 seasons with St. Louis and 13 seasons in total. The ’79 Crimson Tide captured the 1979 national championship under the tutelage of Paul ‘Bear’ Bryant. The squad included three First Team All-Americans in Jim Bunch, Don McNeal, and Dwight Stephenson who later starred for the Miami Dolphins of the NFL and ultimately earn a place in the Pro Football Hall of Fame in Canton, Ohio. Bryant’s last national championship was highlighted by a 24-9 victory over Arkansas at the Sugar Bowl in New Orleans, Louisiana on January 1, 1980. As well as guiding his beloved Tide, Bryant also patrolled the sidelines for Maryland, Kentucky, and Texas A&M and amassed a 323-85-17 record as a Head Coach. 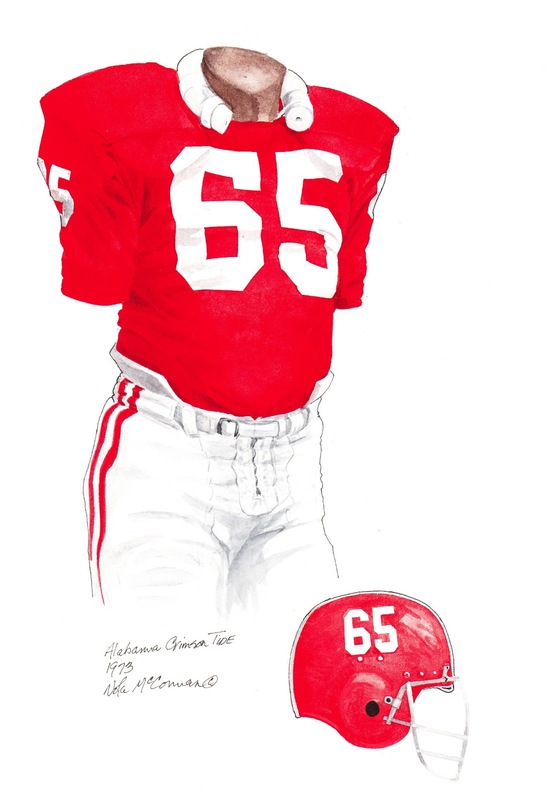 The Crimson Tide football team sported both crimson red and white jerseys in 1979 with sleeves to the elbow and numbering on both the front and back. Players wore white pants with two crimson red stripes down each side with both colored jerseys. Helmets were crimson with a single, white stripe and numbers on each side. The 1979 University of Alabama football team has the distinction of being the first team in school history to win 12 games in a season. This painting depicts the #97 jersey of University of Alabama star Linebacker Cornelius Bennett. The native of Birmingham, Alabama enjoyed four outstanding seasons including three All-American campaigns (1984-86) with the Tide and is a member of the College Football Hall of Fame. Bennett was selected in the first round (2nd overall) of the NFL Draft by the Indianapolis Colts, who later traded him to the Buffalo Bills. From 1985-86, opposing ball carriers had to contend with the formidable linebacking duo of Bennett and Derrick Thomas, an All-American and future NFL star in his own right. Here’s what our friends at Wikipedia have to say about Cornelius Bennett. The ’86 Crimson Tide team compiled a 9-3 regular season record before defeating the University of Washington 28-6 in the Sun Bowl. Coach Ray Perkins, who took over for the legendary Bear Bryant in 1983, coached his fourth and final season at ‘Bama and collected 32 wins against 15 losses and one tie. The Crimson Tide wore both white and crimson red football jerseys in 1986. The jerseys had numbering on both the front and back. White pants with two crimson red stripes were worn with both jerseys. 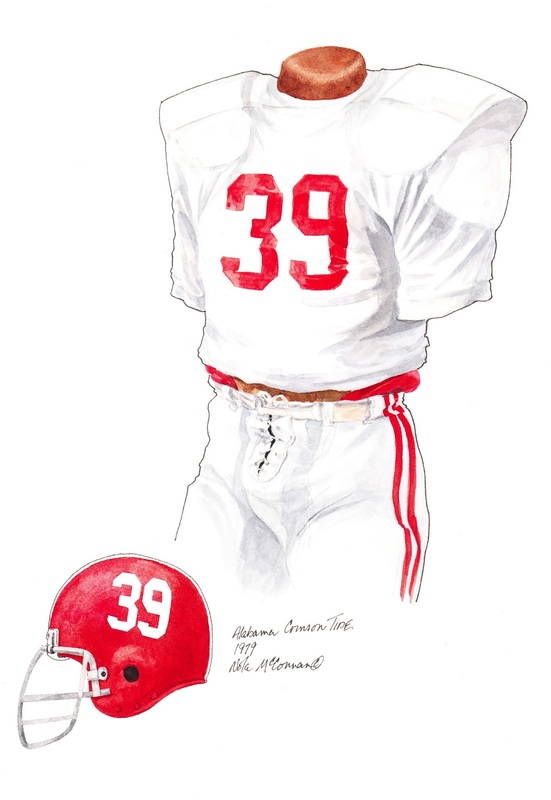 In 1985, Alabama decided to use only crimson-colored helmets with a single white stripe and the players uniform numbers on each side. 1992 marked the centenary of Alabama football and the Crimson Tide celebrated 100 years by going undefeated (12-0) in the regular season and then dispatching of Miami 34-13 in the Sugar Bowl to secure National Championship honors. 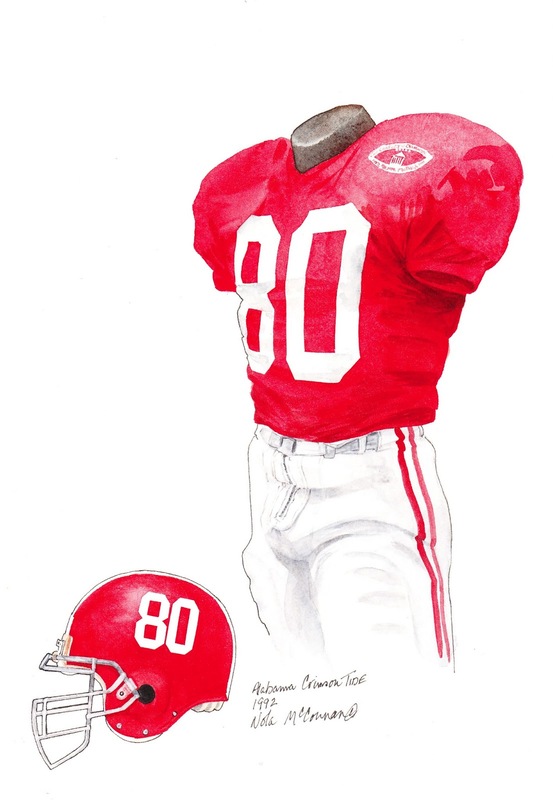 This painting depicts the #80 jersey of University of Alabama star Defensive End Eric Curry. The Thomasville, Georgia native played three seasons for the Tide and captured All-American honors for his stellar play in 1992. 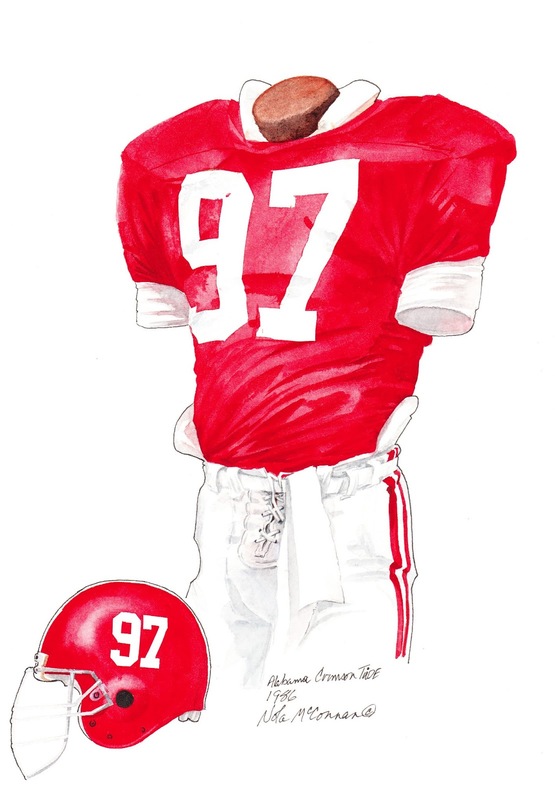 Fellow Defensive End - John Copeland was also a consensus All-America in 1992, the first time the Tide has had two consensus All-Americas on the same team since 1966. After being selected by Tampa Bay in the first round (6th overall) in the 1993 NFL Draft, Curry played seven seasons in the NFL. Alabama were led by Gene Stallings who coached the Tide for seven seasons (1990-96) and compiled a 62-25-0 record. In 1993, Alabama was rocked by controversy and scandal and was forced to forfeit nine victories and finished the season 1-12. 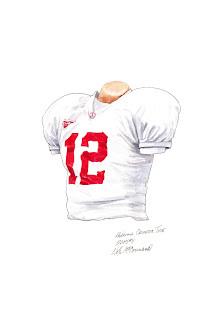 The Crimson Tide wore both white and crimson red football jerseys in 1992. The jerseys had numbering on both the front and back and players’ names were also featured on the back of the jerseys. White pants with two crimson red stripes were worn with both jerseys. Red helmets featured a single white stripe, and the player’s uniform number appeared on each side of the helmet. 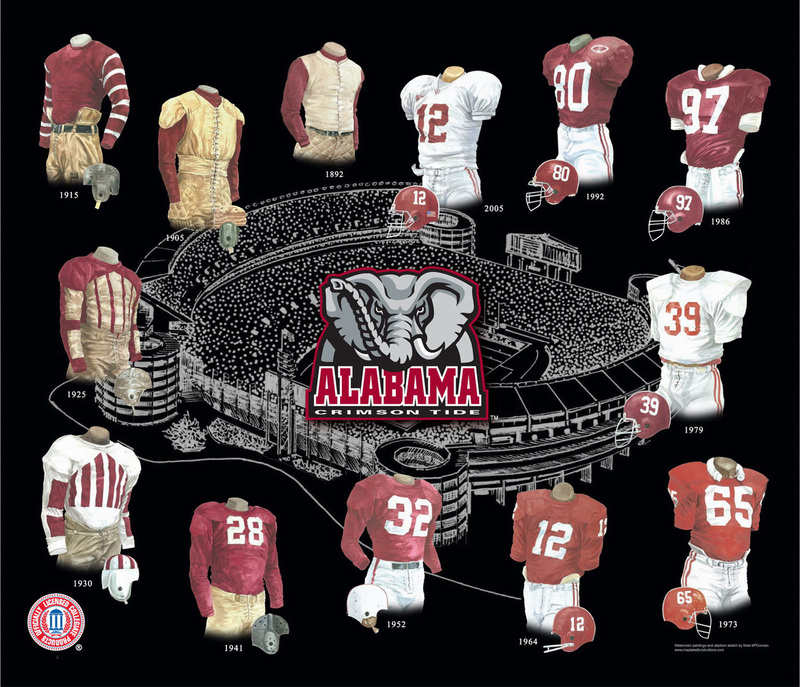 The 1992 features a ‘Century of Champions, 1892 - Alabama Football - 1992’ patch on the left shoulder of the jersey. This painting depicts the #12 jersey of University of Alabama Quarterback Brodie Croyle. The Rainbow City, Alabama native led the Tide to a 10-2 record including a 13-10 victory of Texas Tech in the Cotton Bowl. The Tide were captained by Croyle and DeMeco Ryans in 2005. Former Alabama Quarterback, Mike Shula returned to Tuscaloosa to coach to the Tide in 2003. Shula led his charges to a 26-24 record during his four-year stint as Head Coach of ‘Bama. Shula was replaced by former LSU and Miami Dolphin Head Coach, Nick Saban in 2007. Croyle was drafted in the third round (86th overall) of the NFL Draft by the Kansas City Chiefs in 2006. His pro football career can be followed here. The Crimson Tide wore both white and crimson red football jerseys in 2005. The jerseys had numbering on both front and back and an SEC patch on the right shoulder. White pants with two crimson red stripes were worn with both jerseys. Crimson red helmets with a single white stripe and the players’ uniform numbers on each side continued into the 2000’s. Names on the back of University of Alabama football players’ jerseys began in 1981 while players went back to wearing black shoes in 1988. 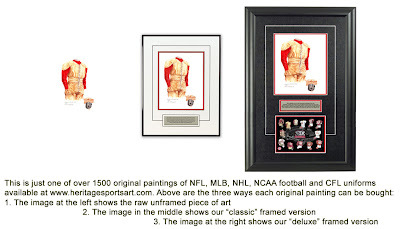 If you love the Crimson Tide and the history of the Tide football, you might really love to own an original piece of artwork celebrating the team's historic uniforms as seen in the poster at the top of this blog - you can actually own one of those original pieces of art! There are only 12 pieces of original art available for sale, and when these 12 are sold, that's it, they're all sold out. 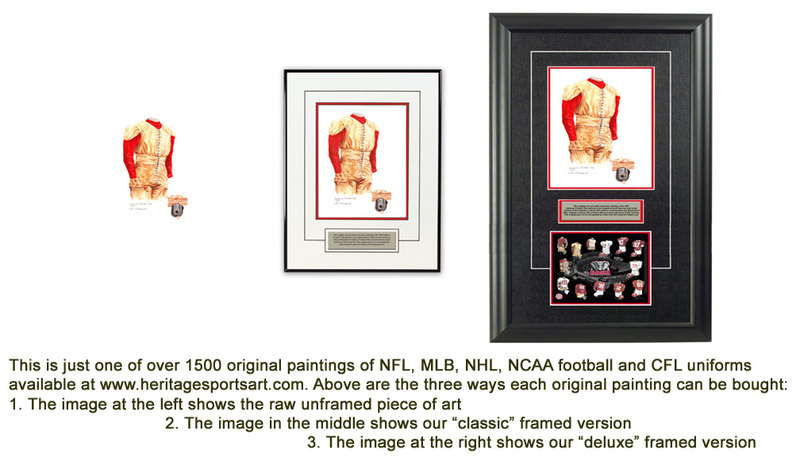 If you would like more information about this great artwork including the three ways you could purchase each piece, please visit our Alabama Crimson Tide YouTube video at www.youtube.com/watch?v=5bSfVPNsYHw or go directly to the artwork website www.heritagesportsart.com/Alabama-Crimson-Tide-c80/ where you can see and purchase the artwork. Nice post. Well, football uniforms may just be one of the most important pieces of clothing ever invented. Devin - Many thanks for the nice comment. Sure a lot of buzz about the Michigan-Notre Dame "throwbacks" that they're going to wear under the lights on Sept 10, 2011. I'm a big traditionalist but I think these "throwbacks" are kind of fun for one game.